Students researchers learn basic coding principles and create web-based mobile apps. Smart phones possess powerful diagnostic potential with their computational power, communication capabilities, sensors, and image processing power. We aim to leverage these powers into useful products. Below are a few of our more developed products. These apps should work on a computer or mobile device and do not require any installation. These are beta level apps that may have flaws and, of course, should not be used for any real medical diagnoses. 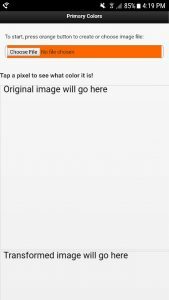 Click on each app thumbnail to try it out! 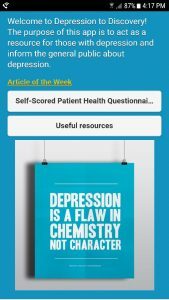 Depression to Discovery is an app based around mental illness, specifically depression. The purpose of this app is to end the stigma behind depression by providing information to the general public about depression. Primary Colors can help someone who is colorblind take or upload an image on a phone or computer and view a processed image that is easier for them to see. This app is designed to aide individuals in a self-examination of their skin. 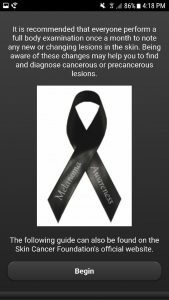 It is primarily aimed towards anyone concerned about cancerous or precancerous lesions. 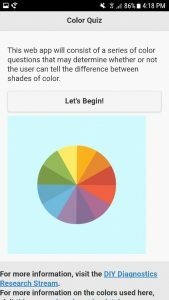 Color can be perceived in various degrees across and among species, and with this application, users can test their abilities by selecting the color sample they see as different than the rest, while being educated about human color perception.